Have you ever purchased artwork that you love, only to find it’s really too small for the space you had it planned for? This is a big mistake I just made with my living room! So I had the artwork framed with a nice thick frame, got it home and it was still too small! I tried to rearrange the room, putting high vases with florals next to it and I finally had to admit, it’s just too small for the space. Then I looked for another spot for it and I realized it really was the exact thing I wanted in the room… if only it was bigger. The obvious solution was to add something else to the wall, but this has to be done with care. It has to look like it belongs and it’s best if it doesn’t overpower the artwork, so proportion is key. In our living room, I solved this problem by adding vintage living room sconces flanking the artwork. 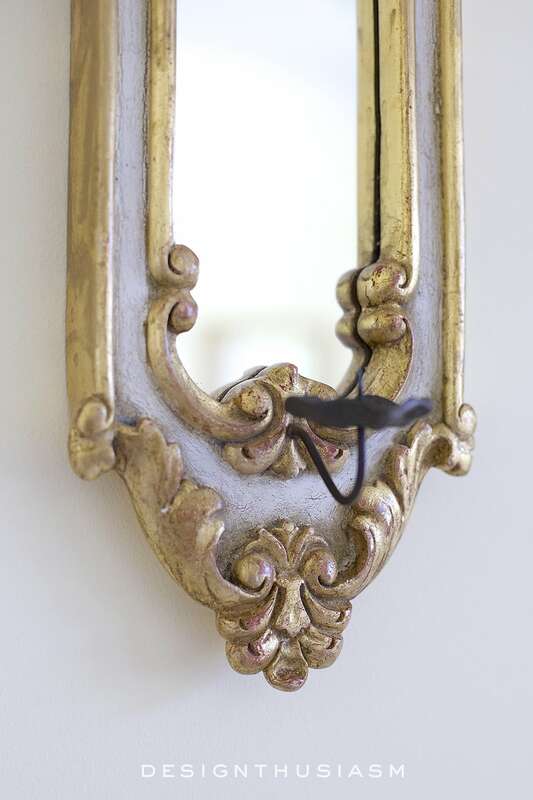 The pieces I found are candle holders with painted acanthus edging framing small vertical mirrors. 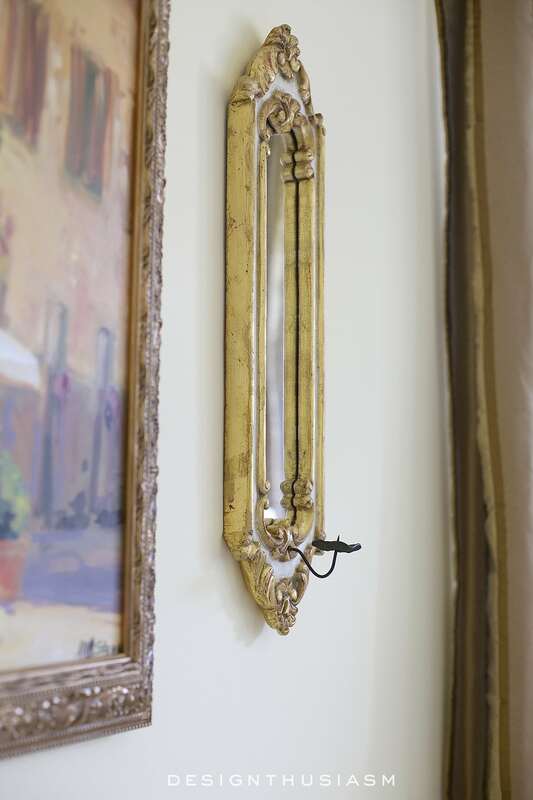 They fit perfectly with the French Country feel of my decor and the long narrow shape is exactly what our wall needed. 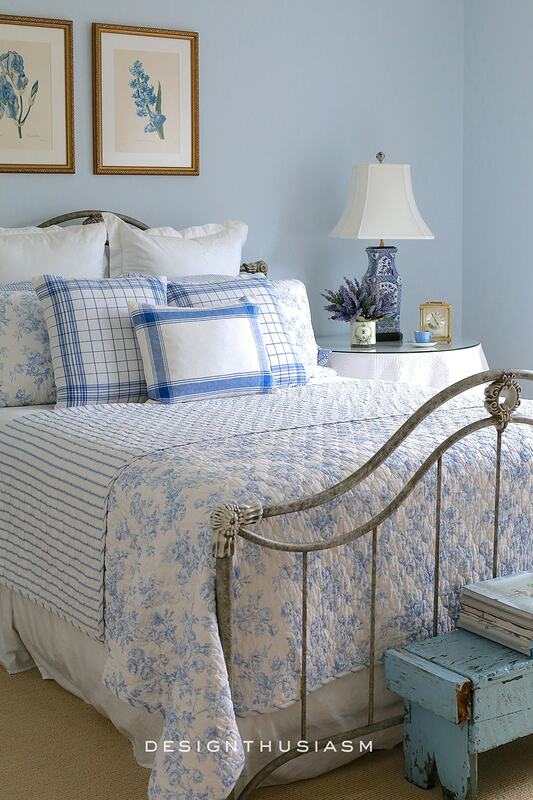 While there was plenty of French Country interest in our room before, this one small difference made a huge impact. 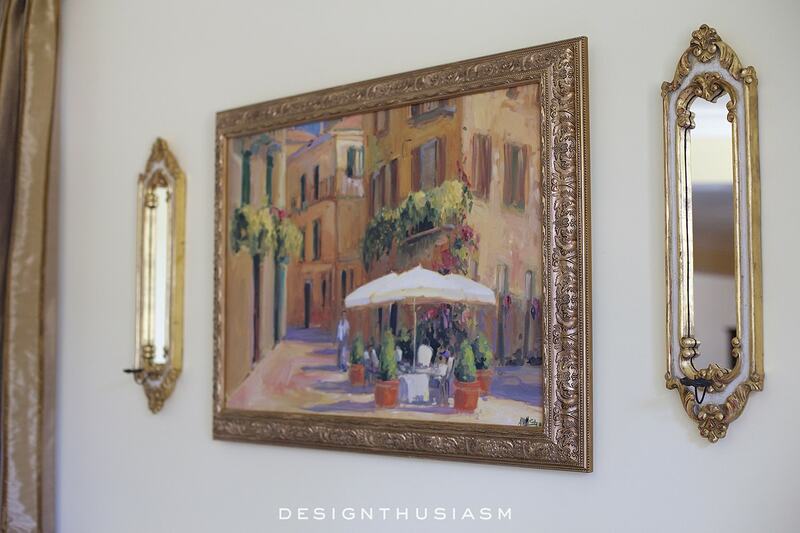 The mirrors help to add a bit of light to the wall and the gilding works nicely with the artwork’s frame. I love the patina of these painted pieces so much, that I’ve been reluctant to cover them by adding candles. The jury is still out on whether I will add them. Perhaps a little votive type will work… what do you think? 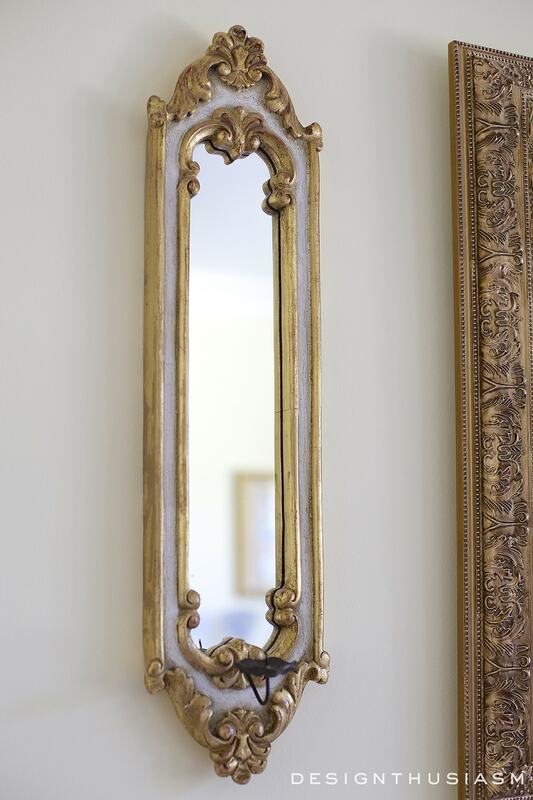 The gilded theme is reflected in other accessories in the room, along with the many mirrors I have throughout my home. Hi, Lory. I think the sconces are just the right touch, and so pretty, too….too pretty to cover up, so I’m thinking votives if you feel you even really need candles. The room is gorgeous!!!!!!! Thanks, Bobbi! Yes, I think they should probably have something, but really small. Beautiful Lory! 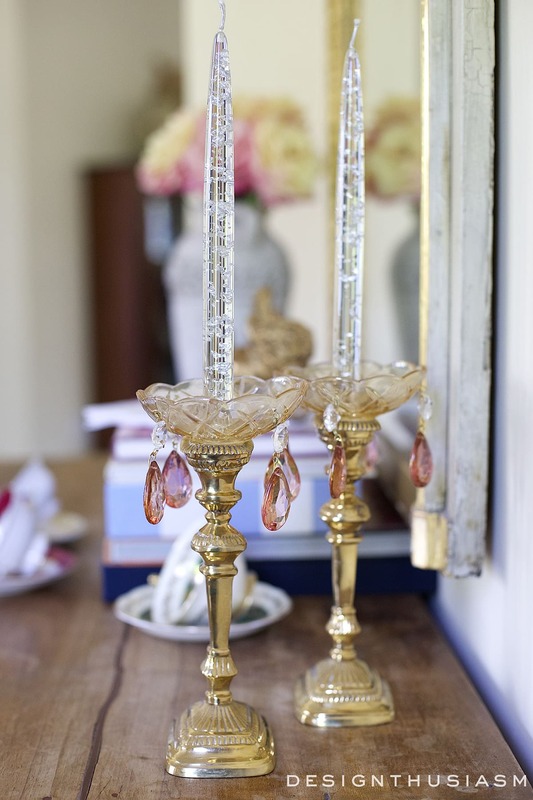 I agree that the patina on your candle holders is really nice and they add to your Frenchy style. Great solution, Lory! Your sconces are beautiful. 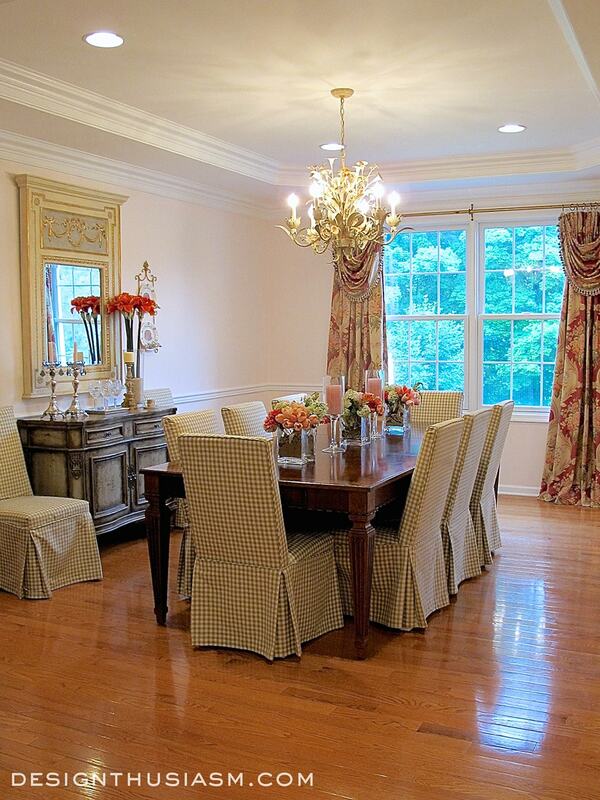 Lory, I love the mirrored sconces. Gorgeous!!! They are the perfect thing the go with your artwork. They enhance it instead of taking away from it. Sconces are beautiful. Been looking for something very similar. Votives only. I think your solution of adding the mirrored candle holder sis great. 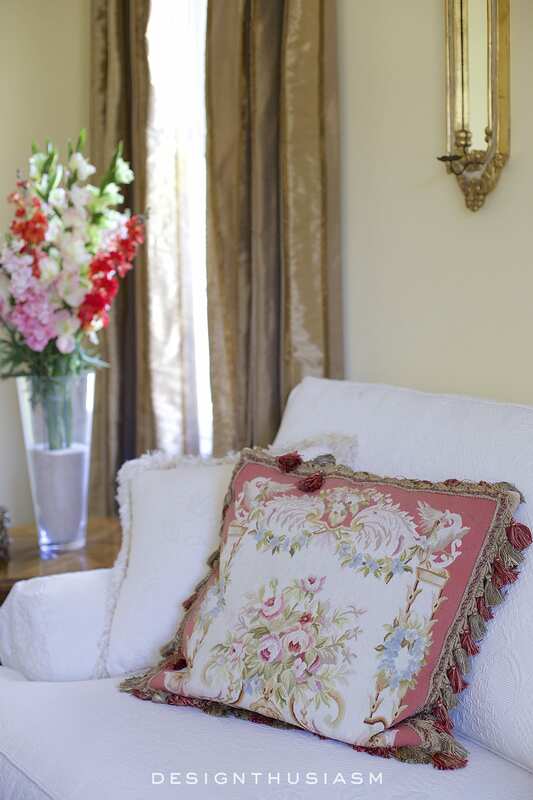 Because you use various shades of pinks in your pillows, rug and decorative touches I personally don’t think the painting works well with those due to the colors in it (though I love the painting). Or perhaps I’m not seeing the colors as they really are on my computer. Just my opinion. You have a lovely home. Thank you for your kind response. My guess is if I could see all the colors in real life I would probably agree. I don’t like matchy matchy really so if you say it all blends we’ll I sure trust your word over my computer screen colors! ? Lory, your solution to the problem was perfect. And I so enjoyed getting a look at your lovely living room! More perfection! Where do you find the beautiful bobeches that appear in your posts? I am such a fan. Thanks, Martha! I was actually glad to do a new post of the living room, since I didn’t have my new camera yet when I did the first room reveal… 🙂 Ah, my bobeches! Yes, I enjoy them too. They’re actually from all different places. Maybe I should do a post dedicated to the bobeches!?! My favorite ones are the silvery grey ones that are usually in my dining room, because they are heavier than the others and made of quality crystal. Most I found in little decor shops or vintage shops, but the grey ones I bought in Mougins, France. Some I’ve found online. Thanks for the idea for a post!! Lory, if you add candles, I would suggest shorter tapers that have been burned for a while to give the appearance of working sconces. 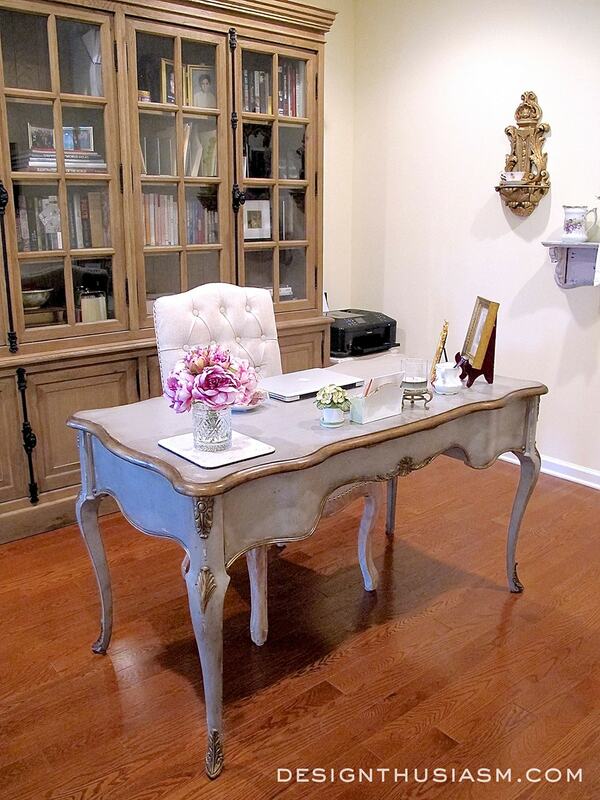 This arrangement is beautiful, thanks for sharing your home with us! Thank you, Sheila! I think that sounds like a great idea… 🙂 Thanks for visiting!! Thanks for this post – I have this EXACT problem in my living room! Your post gave me some ideas for solving this challenge. 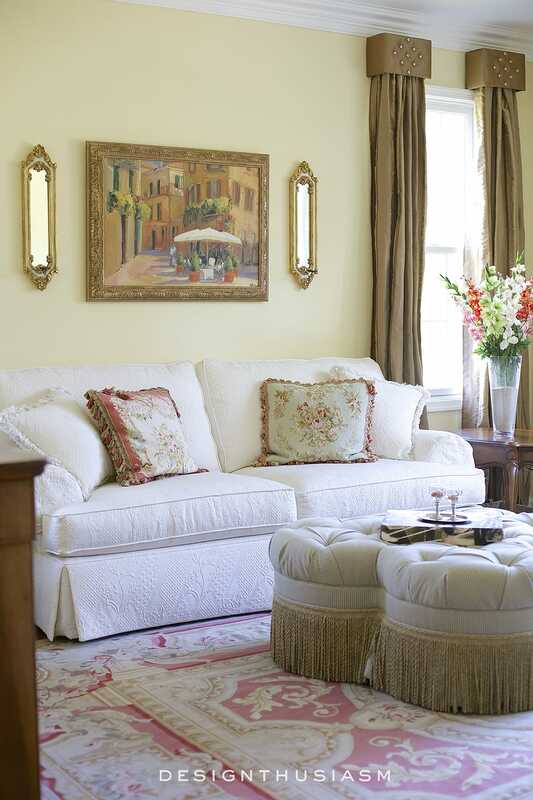 Those sconces and the painting are beautiful! I think they actually *need* a candle (Sheila’s idea of burning some down a bit is awesome!). But certainly, whatever you decide will be right because it’s your home! Perfect solution, and it looks great Lory! Decorating blanks walls is hard. They’re such a blank slate that it’s difficult for me to decide what I want. I can get so lost sometimes I’m not sure what I like even. I love the sconces next to your painting. Sconces can make pictures on your wall come alive. I have the same issue with a picture over my sofa on a long wall. I did hang sconces on each side, but still doesn’t look sized right. Maybe my picture is too low above the sofa. 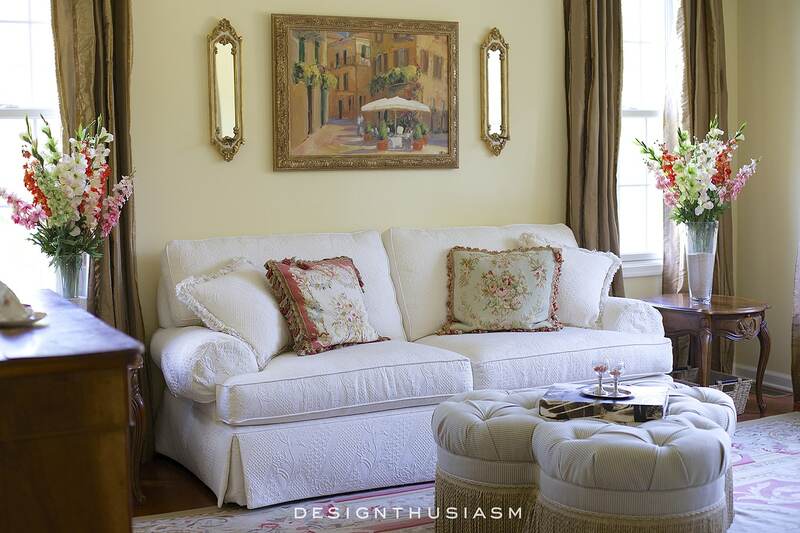 What height do you hang a picture over your sofa? I think it’s about a foot above the couch, but it also depends on the height of the artwork. In general, artwork should be eye level. I’m sure at some point the artwork may be simply too small, but if it’s just a bit too small then adding sconces should help. What is the wall paint color? Love your taste! Thanks so much, Alice!! It’s Benjamin Moore Mushroom Cap 177.